So I have an iPhone. I wouldn’t say that I am guzzling the kool-aid, but taking cautious sips. I don’t LOVE it. I loved my droid. But, we were having an issue that I just couldn’t resolve, so I decided to test the waters with an iPhone. I don’t hate it. It’s taking some adjustment, let’s say. Like for instance, this particular phone always wants to be on whatever local wireless connection that’s available. It’s kind of weird that I get these random pop-ups suggesting different wireless connections. Usually I just cancel it out, because OBVIOUSLY: No. But this one particular time it happened, I was sending a text to The Man and one network caught my eye. My assumption is that before this, his network must not have been password protected. I’m not sure if the opportunity to see this is a PLUS or a MINUS for iPhone. This entry was posted in Random Ridiculousness. Bookmark the permalink. 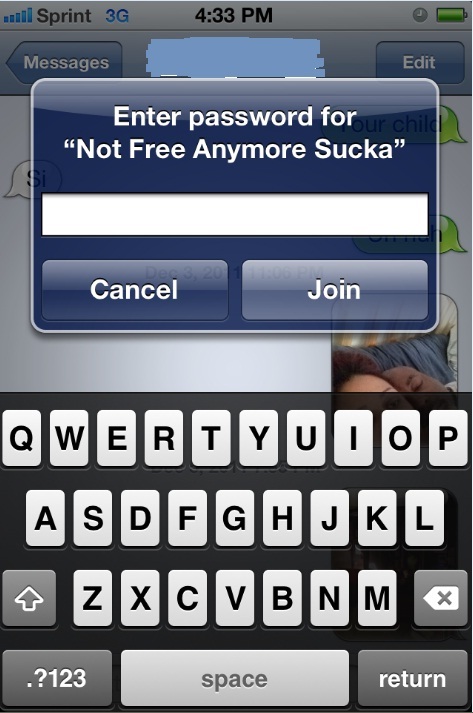 Funny – and that’s a setting in your wireless controls, you can turn off request to join available wireless networks. Thanks! I figured someone would understand this was also a plea for help. These iPhone-a-majigs need to come with tutorials.